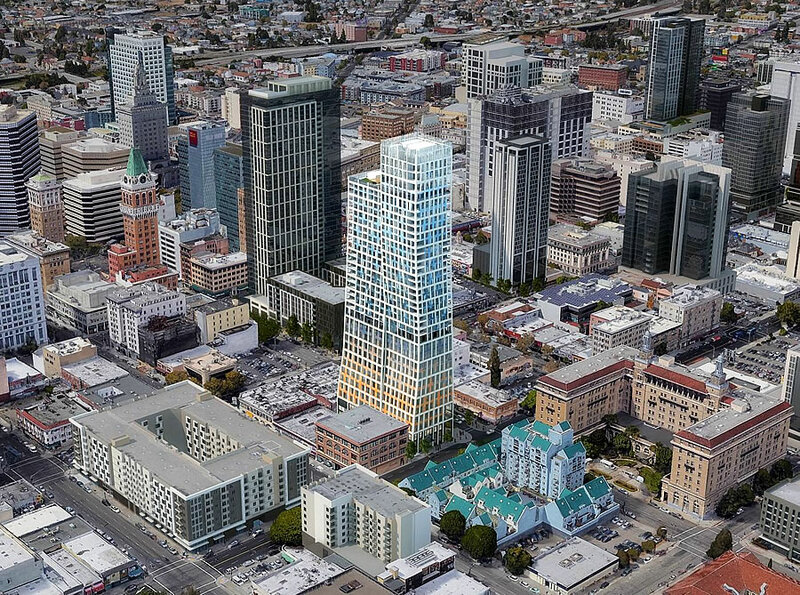 In a move which shouldn’t catch any plugged-in readers by surprise, Oakland’s Planning Commission has set the stage for a formal denial of the plans for a seemingly split, 460-foot-tall tower to rise at 1261 Harrison Street in Downtown Oakland. As proposed, the development would require the demolition of a historic “King Block” building on the project site and the approval of a Conditional Use application to rise over 85 feet in height. But as we outlined last week, Oakland’s approved Lake Merritt Station Area Plan identified the King Block as a specific “Area of Primary Importance,” a designation which prioritizes the adaptive reuse and preservation of specific historic resources and raises the bar with respect to the requirements for a related project’s approval. 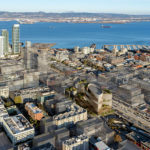 And with Oakland’s Planning Commission having unanimously agreed with Planning Department staff that the proposed tower would not meet the requirements for approval, the Department has now been directed to return to the Commission with findings to support an official denial of the project as proposed. This, coupled with today’s news that the Oakland A’s are all but certain to remain at the Coliseum are two unfortunate examples that a bold and exciting urban vision for Oakland are not a priority to the city family. Oakland is already on its way to becoming an exciting urban center with or without this project. I was downtown on Saturday and was amazed at all the construction. Walked from Frank Ogawa Plaza to Lake Merritt and back to the Oaklandish store on Broadway before heading to Swans Market for lunch. I was amazed at the energy on Broadway and at Old Oakland on a Saturday afternoon. Of course, a ballpark downtown would be amazing and would make the area even more vibrant. Downtown is very walkable, bike friendly, with three convenient BART stations. Something will definitely happen on the King Block. DTO is just too good of a location for this block to remain neglected and blighted. There are too many great projects happening all around this site. I agree! One or two projects going forward or not doesn’t define or hold our city back. We have lot’s of issues but even more potential! It’s why I live here. Less so this tower and more so in reference to the A’s in regards to their decision to play it safe and cover their bases (can’t blame them.) Both Howard Terminal and Peralta sites had the potential to capture and define a type of civic identity and pride that the Coliseum will never be able to do even at full build out. There is no there there. I don’t think the A’s have abandoned Howard Terminal. This might just be insurance and as way to develop the Coliseum site in order to help pay for Howard Terminal. I would think Howard Terminal is a non-starter considering the cost to repurpose the dock structure and pay off Port of Oakland. Have to remember that the original plans for new Warriors arena was on a pier until the costs came out. Agree with Sutro_Tower. I believe a new A’s stadium is a golden opportunity to anchor/rebuild a neighborhood whether it be Lake Merritt or Howard stadium. At same time, open up a huge area for housing development with great transit access site between Downtown Oakland and a future BART extension to a future downtown SJ Google Campus. Oakland has an opportunity to drive a vision beyond an oversized baseball park surrounded by sea of parking. I think the Coliseum can be developed without a new A’s ballpark. There’s already a great arena sitting there. Just build up the parking lots around Oracle Arena. Downtown Oakland needs the A’s and the A’s need downtown Oakland. Howard Terminal is 50 acres. They don’t have to necessarily place the ballpark over any area where there may be piers. Howard Terminal is a bigger challenge to build but it comes with a possible much bigger reward for the city and for the A’s. I think this is all just unimaginative thinking. First off, the arena is almost certain to get demolished, since it will be unable to compete with Chase and SAP at its current capacity. We’ve seen this with other old arenas around the country whose teams leave for new venues. The costs of reducing the capacity to differentiate it in a new market segment, and doing significant remodels to make it more like The Forum, are unlikely to be viewed favorably by any party seriously interested in developing the Coliseum site. I also take issue with the idea that the Coliseum site can’t be developed with a new stadium and ancillary development in a way that brings a sense of place to it. A lot of the new generation of ballparks are in or very near to downtown, but that doesn’t mean they inherently need to be in order to be good venues. The Coliseum site represents a significant opportunity to construct what would essentially be a modern, better designed Wrigleyville. It would also provide a welcome positive focal point to East Oakland at a time when real estate and economic development in the city is increasingly concentrated in the northwest ~20% of the city. And more practically, aside from all of that, it represents by far the easiest, cheapest, and most flexible way for the A’s to get a new stadium before the sun turns into a red giant. The Oakland Arena was completely renovated in 1998. The entire interior was demolished. The only thing “old” about that arena is the classic glass shell with the cross beams. So this arena renovated arena with newish luxury boxes and other great amenities can’t compete with San Jose’s less modern and attractive arena? This arena will not be demolished and instead compete with the more expensive and less convenient new Warriors arena in SF. The East Bay is far more populous than SF and can easily support its own arena. They should build housing, hotels and office space around this still very nice arena. Yes, and Turner Field was renovated for baseball following the 1996 Atlanta Olympics and has already since been demolished upon the Braves deserting it last season for a new *suburban* ballpark village. I have a lot of issues with Manfred (such as his slavish insistence upon instituting pace of play “remedies”), but none more so than his proclamation that that is the model for the future. The advent of new downtown ballparks with Camden Yard was the best thing to happen to baseball in half a century. However, he would probably look very favorably upon converting the Coliseum site to a similar development and get MLB behind such an effort. You are willfully ignorant of how arena competition works when there is evidence of it nationwide. There is no plausible reality in which Oracle (as is) can or will compete with the 2 other arenas in the region. If they substantially reduced the capacity, which has been suggested by some parties before, it *might* be viable. Without that it’s simply not and there’s no developer so far that thinks it would be. What exactly is wrong with Oracle Arena? Oakland would be foolish to tear down or downsize beautiful and still modern Oracle Arena. The only ones to benefit from such a a horrible decision would be the Warriors and other San Francisco interests. The city needs to be more visionary. The area around Oracle Arena is very bad. What do you mean “very bad?” You mean the asphalt in the parking lot or all those hotels on Hegenberger? Hegenberger, International, 73rd, they are all pretty much dangerous parts of Oakland as far as crime rates. Hegenberger is not “dangerous.” The crime rate in East Oakland has come down quite a bit and there is new housing going up across from the Coliseum BART station. There is nothing in Oakland with the crime density of the Tenderloin and that doesn’t stop businesses and people from going to downtown SF. People have to stop vilifying neighborhoods with are majority minority and lower income. 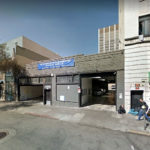 Plenty of people avoid the Tenderloin, and Hegenberger is in fact dangerous. Nobody vilified anything. It’s just a bad area. You vastly overstate the impact of the admittedly idiotic decision of Oakland’s city planning departments. Oakland has not merely on the books but in the process of actual construction a slew of skyline-changing high rises and housing developments. It is far too soon to state as a fact that the city has banished the Oakland A’s to the garish urban Siberia of the Coliseum. I agree that time and again, Oakland’s urban planning and buildings departments implacably oppose “bold and exciting urban vision[s]” for Oakland, risibly opting for a mid-1970s horror of what was even then the outmoded “International” style. And yet, somehow, as if by deus ex machina, Oakland has gained a pipeline of interesting buildings that have not only entailed ground-breakings but also bona fide construction. Hope, not to mention dissent, Oakland advocacy, and ambition on the part of the city’s citizens and prospective developers, not only spring eternal, as it were, they are achieving benchmarks IN SPITE of the usual moronic city government commitment to stupidity, mediocrity, and general failure. Perhaps they can find another spot, there’s no shortage of buildable sites…or at least more buildable than this one. That would be the best of both worlds. However it seems as if the development restrictions were baked into the price of this parcel and finding a “plan B” parcel might be too expensive. I hope so, too. The proposed design was strikingly beautiful, bold, and would have led, in my view, to an instantly iconic building. I long thought the same about the basic facade of the SOM design for the Transbay Transit Center. Don’t know that it was ever used anywhere. Too bad. Great example of Oakland not doing itself any favors. Yep, makes no sense. That building will continue to sit there and rot away now. No one will want even consider that site as an investment now. Too many barriers the city has arbitrarily put up. Good point. This will deter anyone from trying anything on this site. I bet the existing building will only get more dilapidated, which is definitely not good for Oakland. Does someone have some inside info – literally or figuratively – that this about to become some hovel? I haven’t seen it firsthand, but the people who did and commented last week didn’t have good things to say. There were interior photos provided in one of the Planning reports. I can’t remember where it was. I personally think there should be more tenants occupying that space to add density. A low rise building with a few tenants seems like a waste of valuable downtown real estate. What I can’t understand is that if developer can replace an asset with another one which results in far more income for them (and the city) why should they not be allowed too? What is historic about that building? There is nothing remotely “historic”–– or architecturally, culturally, aesthetically, or remotely socially significant––about the King family buildings. Just as perversely, the King family that built the structure a century ago were a minor dynastic family whose evident wealth and “prominence” dissipated entirely over the ensuing century. The King clan, as it were, were white, wealthy, and thus politically “prominent” one hundred years ago when Oakland was an overwhelming white, very racist, and non-descript industrial town. And the King’s business had no lasting impact upon Oakland’s economic standing; left no new technologies or distinctive product, let alone anything remotely innovative; left no enduring cadres of field experts; left no cultural institutions, educational centers, land, parks, not even a park bench for Oakland’s future generation. Say what you will about the Kaisers, Knowlands, or even the Lathams, they are true dynastic Oakland families whose contributions are all around the city today: Kaiser’s health care corporation is one of the nation’s largest (and most progressive); the Knowlands left iconic towers, land for parks, and the basis for what has transformed itself from a tiny “also-ran” into one of the leading, most forward-thinking institutions of its kind in the entire nation: the Oakland Zoo. The Latham Trust still actively endow Oakland cultural institutions. THEY––the Kaisers, Knowlands, Lathams–-were dynastic Oakland families whose contributions endure today. The Kings? Not so much. The decision not to build what would have been an iconic building and tax base reinforcement is one of the worst, stupidest, inexplicably feckless decisions I have seen Oakland’s city government undertake in years. And given said departments’ less than stellar performance (I am speaking charitably), that really is saying something. And guess what? The city’s denial of this project sends a signal to other developers who would have been interested in this area, that it is far too difficult to develop there. For this reason I see the existing building and the buildings surrounding it falling further in disrepair in the future because no one cares about them. Nothing positive comes out of the city’s decision. No, it does not. But it does signal that comprehensive and long-range area plans, which took years to research, formulate and adopt, won’t be abandoned ad hoc. Let me clarify. It seems that in order to demo that site 3 things must happen; proving the existing structure cannot be profitable, that the existing historical elements be integrated into a new structure, and the new proposed structure is below the height limits. Could be wrong but that would seem discouraging to investors. That’s possible. And in which case it’s a good thing the aforementioned plan not only identified other priority areas for development but also cleared the way for expedited approvals within the area’s boundaries for conforming projects, including cater-corner across Webster and 13th and across from the King Block on 12th. And of course, the Harrison Street site remains zoned for development up to 85 feet in height. “Ad hoc” is the way to go when something better comes along. And not all plans are perfect. Maybe there are instances they should be reevaluated if conditions change, like the market. Perhaps there is a time to reevaluate particular blocks or a block within a long range plan. For the most part I’ve liked what Planning has done, for instance, The Broadway Valdez District Specific Plan. You can definitely see the positive results from that. But my issue is with this particular historic block, not comprehensive long range area plans. It’s easy to take exception with individual parts of a larger plan. Regardless, while said larger plan definitely raises the bar with respect to granting an exception to build above this particular block’s zoned height, it doesn’t prohibit its redevelopment. And in terms of why someone might want to redevelop this block, perhaps the impact of all the surrounding development, which the aforementioned larger plan has recently accelerated and streamlined, might provide some sort of incentive (and a clue). 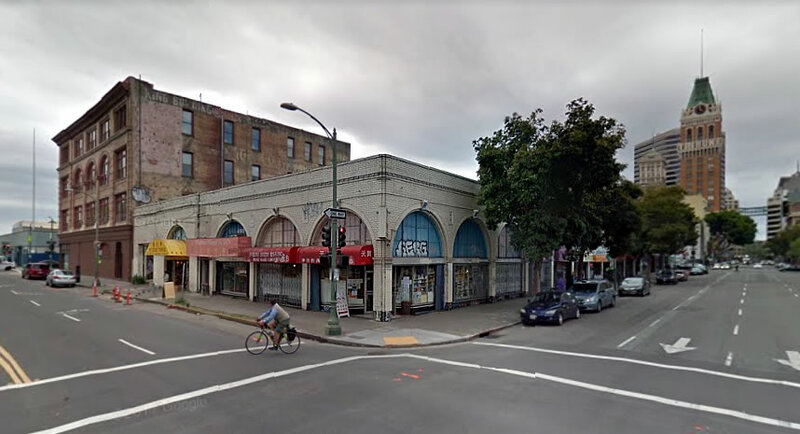 I would suggest, for this block, more consideration be given to potentially addressing the housing shortage in Oakland and the Mayor’s plan to add thousands of housing units in Oakland and increased revenue, rather than historical preservation. Given that the (pending) rejection is site specific, and the city specifically doesn’t want the site developed – at least not as an outright demolition – I would say they’re getting exactly what they wanted. Your claim of this being some kind of “signal” would seem to be offset by the many developments going on around it. I am specifically referring to that “historic” block that is run down and will most likely deteriorate because of the regulations the city placed on it. The “long range plan” for this block, as it stands, benefits who? No one has come forward to renovate the existing “historical” building in the past so why should they in the future? Wow…the bar set for the requirements that outweigh “adaptive reuse and preservation” must be as tall as Everest. Truly pathetic, but typical of the Bay Area, where any shoebox built before 1980, regardless of the architecture, is considered a historic resource. A key – and explicitly defined – consideration is whether an adaptive reuse/preservation would yield a reasonable return. Did the developer own more than just this parcel? Since they were planning on demolishing the building, I’m unclear on what seismic upgrades would be for. If it had been an affordable housing tower it would have sailed through. That design is ugly. That being said stop living in the past, tear this dump down, so families can have a place to live if they improve the design. ‘Never look back unless you are planning to go that way.” Henry David Thoreau..
Oakland needs to move forward. This obsessive compulsive disorder with preserving the mediocre examples of the past is costing an an entire generation the chance to lead a better life. It past time to rewrite the laws. The preservationists in the Bay Area are ruining it for the rest of us, driving up housing prices and making intelligent design and development impossible based on their absurd and subjective desire to keep every bland and tired brick box that has reached the end of it’s useful life. Save the truly distinctive and quality examples of a particular time and rebuild the rest until it’s great. Preservationist have done more to cause our current homelessness and affordability crisis than any other one group I can think of off hand; they are the Evangelical Trump supporting Republican nut-job NIMBY’s of the city planning world and they need to be stopped. “Preservationists” whom you decry indiscriminately serve vital roles as to preservation of any city’s essential and complex legacies, meanings, histories, narratives, much along the lines of which the historian-philosopher Jorge Agustín Nicolás Ruiz de Santayana y Borrás articulated in his now over-used but still relevant adage on the price of forgetting history. But the issue here is not preservationists per se but Oakland’s city planning and development offices. They are fabulously…myopic and an impediment to almost every good thing Oakland has achieved during its stunning revitalization. I submit that it is the collection of these hidebound, fanatically dimwitted philistines to whom we should address our undying contempt. This site is 5 MINUTES walk to a BART station and they rejected it to preserve some squat old building that they deemed historical. Oakland has a housing crisis that needs to be addressed and one of the best ways to do that is to construct high density near transit stations. I don’t understand Plannings valuing system in this instance. Take off the rose colored glasses. I really do like Oakland and own property there but let’s be honest, Downtown is no better than a 2nd tier city in the rust belt. A very long way to go unfortunately. It should be doing better but it is not. this is, sadly, quite true. Downtown Oakland is booming. The downtown Oakland neighborhoods of City Center, Old Oakland, Uptown, Jack London Square, Chinatown, and Lake Merritt are all booming. I know, because I was there on Saturday and saw all the construction and packed restaurants in Old Oakland and Uptown. I was Uptown on Grand @ Broadway last Saturday. It was sadly a ghost town. I have been to most of the rust belt cities and they are struggling. Oakland is obviously booming. That comparison might be a bit of a stretch. I’ve been to downtown LA and downtown SJ and Oakland’s downtown is far more vibrant. I was in LA over a Memorial Day weekend and the very clean streets filled with shinny skyscrapers were devoid of life except for the Mercado at the end of the Angel Flight tram. The place was a ghost town. Who are these people who have to always make up negative narratives about downtown Oakland? If you feel so great about Oakland, why the need to put down every other city in the state? I wasn’t putting down downtown LA. I was just stating what I experienced. I’m sure downtown LA is booming during business hours. It’s not a lively place on weekends and on holidays. Oakland has more high density residential in and around its downtown therefore it is more vibrant on weekends and after business hours. The very high density Gold Coast, Adam’s Point, Chinatown, Jack London Square, Old Oakland, and Uptown all have residential components thereby enlivening Downtown Oakland after business hours. DTO has an office population of about 85,000 and a residential population of around 20,000 and rapidly growing. I will say that downtown LA where the highrises are located was very, very clean and well maintained. There was no litter, no graffiti or stickers like you see in downtown Oakland and downtown SF. They do a much better job of keeping their downtown clean and well maintained than we do in Oakland and SF. Makes me wonder why bigger cities are cleaner than SF/Oakland? LA is really turning the corner and becoming more transit oriented and building up their downtown. I still see a lot of potential in Oakland. The city just needs to let progress happen more easily. More and more people are wanting to invest in Oakland and Oakland’s reputation is quickly improving. Recently I have seen a few tourist, who appeared to be foreign, taking photos in downtown. I had to do a double take. I think recent data shows that LA transit use is trending down. The reason is that transit near density is gentrifying neighborhoods. Then, the newly arrived in the newly gentrified neighborhoods tend to have cars, and drive places. Oakland’s Downtown is clean in certain areas and not so clean in others. They keep City Center spotless as is Preservation Park and Jack London Square. Old Oakland is also pretty clean as is Frank Ogawa Plaza Uptown, and Lake Merritt Financial District. The not kept up areas are east of Broadway between 12th and 15th streets all the way to Harrison. Downtown LA is mostly a business center with LA Live as a sports and entertainment area a bit further south from the core. There have been more residential highrises built recently. I wonder how much of a decline is do to Uber and Lyft? Alot of transit agencies are being hit hard by transportation network companies. Downtown Oakland could definitely benefit from a nearby A’s ballpark. The best solution is Victory Court. The city briefly considered this site in the early 2000’s but it was doomed by Jerry Brown’s downtown housing focus and dissolution of redevelopment. Victory Court would provide a city skyline backdrop, is transit accessible to BART, 880 and Amtrak, adjacent to a thriving residential district, JLS, water, etc. Its actually a better location than the Peralta site with excess land for ancillary development. The A’s should invest in that area to build a jewel-like stadium. The Coliseum site is much better suited for tech, high density market-rate housing, hotels and retail. Howard Terminal will never work for the A’s; its isolated and too far from mass transit. Perhaps a better use would be Convention/Trade Center there. I think the A’s are going for Howard Terminal. The A’s are entering an ENA with Oakland for both Howard Terminal and the Coliseum. I think the A’s will develop the Coliseum and build on Howard Terminal. The walk from the BART entrance at 11th & Broadway is less than 3/4 of a mile if the A’s build as close to the Clay Street Ferry Terminal as possible. The walk from City Center/12th Street BART would be a very cool urban walk through the beautiful historic buildings of Old Oakland and straight down Washington Street all the way to Embarcadero. JLS and Old Oakland would be incredibly energized with a ballpark at Howard Terminal. This would give the A’s the prettiest setting in MLB. I agree OakArch. Victory Court seems like the very best location by far but I can not understand why they are not pursuing that. The second best, discarding Laney, would be Howard terminal. I also agree that the Coliseum site is a better suited for office and housing development. It is easily accessible to the airport for business travelers. Sports venues should be near downtown. Wouldn’t the cost of clean up and infrastructure at Howard be more costly? But I’ve never been a fan of HT, so that’s the extent of my pleading its case. 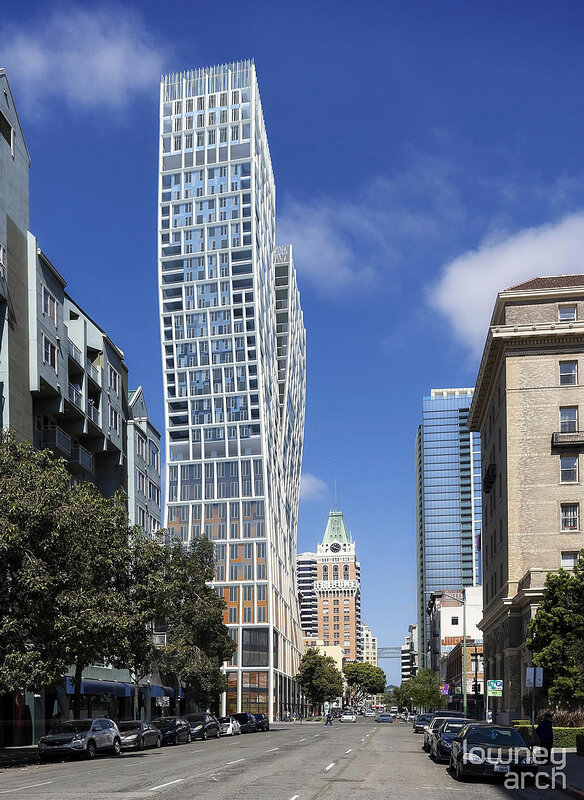 Aesthetic complaints over the appearance of the (hideous) proposed tower aside, why choose to build on an intact historic block instead of the dozens of vacant sites downtown? There are so many derelict midcentury low-rise buildings with little or no architectural integrity on Harrison and Webster between 15th and 20th; prime areas for redevelopment with no need to raze historically important parts of the urban fabric. Glad the City of Oakland isn’t asleep at the wheel.